Playing make believe is a huge part of playtime in our home. We love to play with little figures in little doll houses or playsets and I know my girls can do that all day. They even let me play sometimes too, until I get too boring. Then they just ask for snacks, I think its a polite way of asking me to go away. I suppose moms can be boring sometimes, compared to kids. 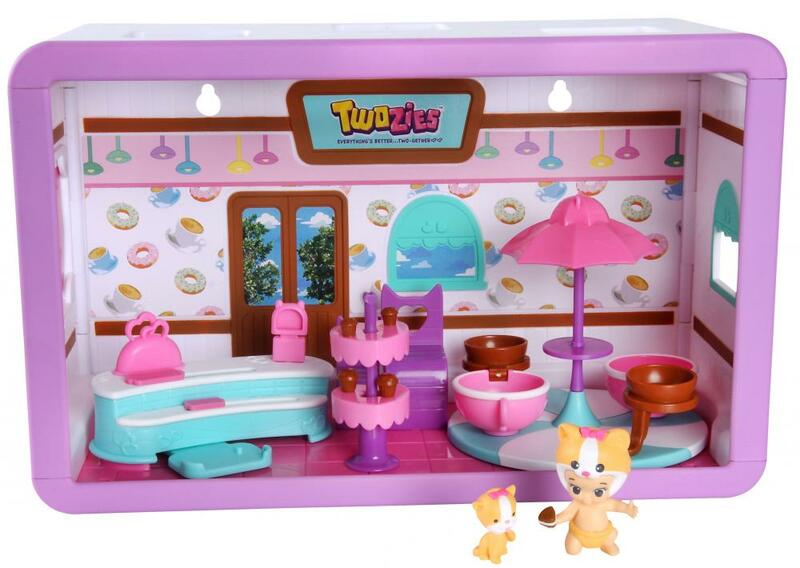 They have really enjoyed the Twozies Two Playful Café Playset recently and I find it absolutely adorable! Twozies is a cute little animal and then it is a baby that is dressed up exactly like that animal. They would be twins, if one was not in a costume. With the cafe they can go and have a tea party, have some delicious muffins to snack on and then twirl around in the teacups. My daughter commented on it being like the teacups at Disney Land. That just happened to be one of her favorite rides in the whole park. I think it added a little more spark to playing with this playset. I think that the Twozies make adorable besties and my children love them. I had no idea there were so many Twozies available, because now my girls are asking for even more Twozies to go with this playset. I imagine they would make great stocking stuffers, and I plan to find out. This makes an excellent gift for girls 4 and over! It will bring hours of imaginative play and even opens up the possibility for other toy options for them down the line with all the other sets and Twozies available.